A great basic for dance class. This cap sleeve leotard features a simple scoop front and back, a ballet cut leg line, and front lining. These leotards are made well and can withstand multiple wearings and washings. I use them as well as the white and light blue for class uniforms for my younger students. This leo fit great! I feel like compared to other companies who have similarly sized leos, this is the truest to size. My 3 year old is VERY petite, only 22lbs and 32in tall, and the smallest size fit her beautifully! This fit my daughter true to size. This is the one brand that is actually easy to figure out the size and I know that it will fit. My daughter is a tall for a 10 year old. She is between a 12-14 in clothes and I bought her the size 14. Great leotard! Quality is excellent. Fits perfectly! I bought this for my little one over a year ago and it's held up great. Love the quality and the fact it doesn't run small like other leotards you find in local stores. I just bought the next size up (small) because we both love it so much. She just turned four in September and we are going to get plenty time with the next size up. Must have! My daughter has been wearing these leotards (one light blue, one pink) for her "littles" ballet class since last fall. She just turned 4, and is very tall and long in the torso for her age. She's been in a size small (4-6) and it has been fantastic. Just the last couple of weeks I noticed she has grown just to where the leotard has started to ride up in the back, but considering she's already wearing size 6 shirts for length, I call that a good investment. They have weathered a 3 year old and her messes, a stain came out of the pink one, and they both still look nearly as good as new. No holes or tears or trouble with seams. We will be buying this again for next fall, sizing up to medium. I completely recommend this leotard. Purchased for my tiny dancer. She has another from Danskin in a larger size that is inches smaller than this one. Good news is she will get to wear this for 2-3 years. Pretty color and seems to be made well. Love the pink, matches her ballet pink tights perfectly. It runs large for us. She's a petite 3 year old and the Toddler size is a good 2 inches larger than her other leotard (another brand) which is a size 4. We needed a short sleeve to fit under her angel costume and it works. She's able to dance with the extra room and this leotard will fit her for some time. I can tell it will also hold up well and still look great long after it no longer fits. This is a great leotard. Last year and this year, I ordered two of these leotards for my now 6 year old daughter - one in pink and one in black. They fit well and lasted her the whole year last year (Sept. - May), and she wore the pink one for tumbling during the end-of-year recital. I was so pleased with them that I bought the exact same ones this year a size bigger. I would definitely recommend this product. My first time ordering, I ordered the size my daughter is growing into...fits perfectly and is very comfortable on her...no riding up her rear end. Good fit on my 2 year old (a little bit big, but she's a bit small for her age). Matches her ballet slippers well - kind of a muted pink. Very soft fabric. I buy quite a few items from here, for my Granddaughters. I have not been disappointed by any of my orders. I bought one for my older daughter, and she is still wearing it in her second year. They run a little big, but I like that because then we can get two years out of one leotard. Just got a smaller size for my second daughter, after getting a different brand which she outgrew in 3 months. This leotard fits great with room to grow. The quality for the price is amazing. It gets washed every week and it looks like new after a year and a half of wear. I will stick with this from now on. I love the price, modesty and fit. The leotard is supposed to be white but it came in as off-white. They were used as flower girl outfits. The other 3 girls moms ordered the same leotard and they were also off-white. And it runs a bit small. On a positive note, the leotard is very well made. The girls looked very cute in them. The thick smooth fabric makes this short-sleeve even wearable in the winter season. Very nice! The white is bright and nice. Unfortunately the Toddler size falls out rather small, so it's probably only good for one season; nothing to grow into it. Also the cut/ shape of the legs seem a little tight for my daughter. She is approx. 36 inches and 35 pounds. My 4 year old daughter (almost 5) is very tall for her age, so we ordered a small 6x-7, and it fits her perfectly. I ordered size based on the measurement chart. This fits true to size I ordered XS for my 3 year old who wears 3T. It fits perfectly and even has some room to grow. Material is comfy. Not sure about the durability as it hasn't been washed yet, but the material is thick I would assume it would be pretty durable. Very well made and durable. Size Toddler fit my daughter (3 yrs 1 mth) comfortably. I ordered the lavender leotards. I thought the color would be similar to the ones pictured online. They are closer to purple vs. lavender. the overall quality is nice. Once again, Bloch hits it out of the part with another home run! I've been a teacher since 1980 and these are the only leotards that don't have kids saying they itch. They are very soft and wear well. These are the exact ones I require for my preschoolers to wear. Black Leotards, Pink tights and pink ballet shoes (Bunny Hops by Bloch). Soft, soft, soft! Can't say enough about them! I loved this leotard for our little ballerina and plan to order all the colors that are available in this style. A while back I purchased one of these for my daughter and she loves it. They run small so hear the warning, but I like these leo's because they have Pre-Teen sizing! My daughter is tall for her age and the pre-teen size is just perfect! They are soft and comfortable and stand up to a childs energy. We have one in lite blue, purple and now black. If she was done growing I could use them for a couple of years. Customer Service was very nice and the shipping and overall service was excellent. Thank you so much! My daughter wears 6X in school clothes. I ordered 6X-7 and it fits just fine and will be good till her 7th Bday. Ordered the 4-6 size based on the measurement guides. My daughter is 2 months away from her 4th birthday and when trying it on straight out of the package this JUST fits her. Am sure I will need to order the next size before the school year is through. My daughter doesn't like tight fitting clothes so even if the leotard is supposed to be stretchy, she won't wear it if the fit is much more snug than it already is now. Suggest when ordering, go with a larger size unless your child measures on the low end of all the measurements as mine did. The material feels more sturdy than I expected so am pleased and guessing it will be very durable. it seems to be very comfortable on her also. Ordered my product and with just the normal shipping it took 1 week so was very happy as dance class started the next day! I ordered 3 leotards for my daughter and her classmates. The package status said delivered but the package was no where to be found at my job place. I contacted DD and they were wonderful in helping me expedite a new shipment to arrive in time! great customer service! The leotards are wonderful too! I would definitely order from them again. I bought this leotard for my 3 year old daughter. It fits her perfectly & is very well made. This leotard is a nice quality fabric and fits my 4 year-old comfortably. This product fits great on my daughter its super soft and very comfortable, also this leotard does not bunch at the bottom like most do. Bought this for my daughter's first time in ballet. I ordered the child size 4-6 and it fits her like a glove! She is 3 yrs old, 38 lbs and 40 inches tall. It does not at all appear too large, but it's roomy enough that it will allow for her to grow. I'm very happy with my purchase! My daughter is a petite 5 yr old. I bought this one in a size 4-6 small, and it fit her perfectly. It was snug not tight, but I prefer it that way as it is ballet and her clothes can't be shifting around. I would say it would be too small for an older 5 yr old or a 6 yr old though. My daughter turned 5 in June and we got this in August. I bought another one by Bloch from a dance store, in the same size, and it also fit well nice and snug but not tight. It doesn't leave marks on her skin and she doesn't complain of anything. (My daughter wears 4T in pants and 5T in tops or dresses) if that helps. New to the dance world we were unsure about sizing and some of the explanations on the website were confusing. Friends use this brand and love it. We like it but once she got into class it kept riding up and was bothersome for her. We picked the size she wears now, but really need a larger one because they seem to run a bit small. 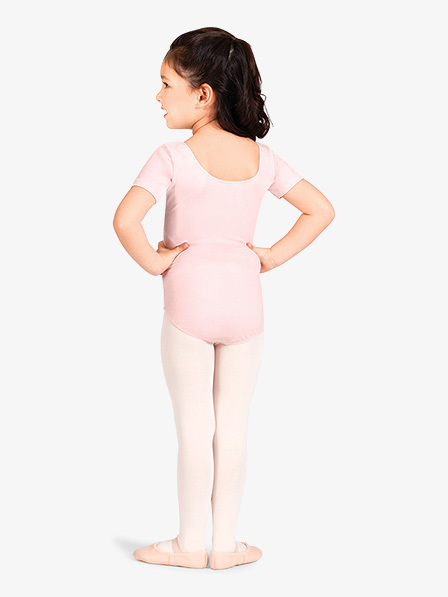 Great color and super-soft material makes it very comfortable for my little ballerina. Fits true to size. I really love this leotard. Even though i just got it a week ago i have already worn it to ballet and it is very compterable. I got 2 of these leotards in violet and light blue and i LOVE the colors. This was a graet buy! I'am not disappointed with this leotard at all. The lining inside is perfect for durability and washes I'm sure. My daughter is 4 years old and I bought her the Pink in size P (4-6) it fits her just fine. I'm impressed with the quality of this material - no complaints Happy Customer!!! I bought two black leotards for my twin girls, and they used them for their dance class from January through May. The quality is great. The cotton is soft and stretchy. They are easy to put on, and they look beautiful in their little bodies. They're five years old, and I decided to buy size S. That's the right size for them. The material is great and it is well worth the price. The fit is just right to my daughter's size. Will buy again. I have bought the short sleeve and long sleeve version every year for the last 3 years for my daughter. This leotard is the best, holds up to weekly washings. Soft comfy material and the lined front is a plus. Price can't be beat. Excellent leo for the price! This is the leo we use for our classes. Holds up well through many washes. Which skirt best goes with this leotard? 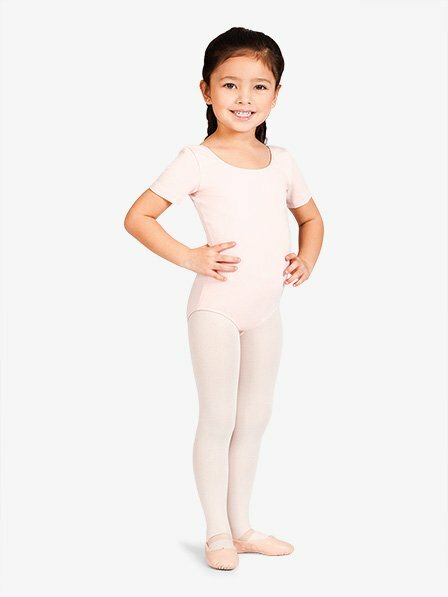 On childrens leotard, what sizes does a small fit? The childrens size Small will typically run as a 4-6. If you have any questions, please contact Customer Support for further assistance.